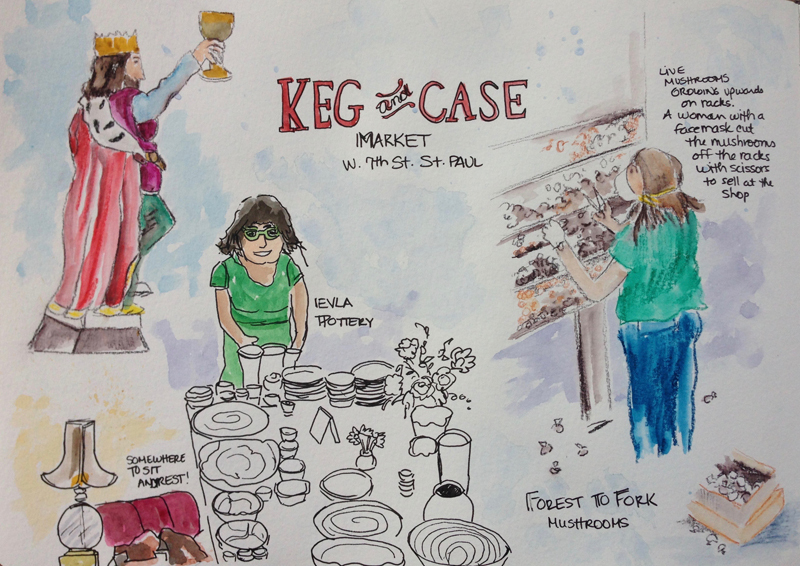 Yesterday our urban sketching group met at Keg and Case Market off 7th St. in St. Paul. A large warehouse-converted trendy foodie/art market across from Schmidt’s Brewery was a wonderful place to sketch! After floating around past the Worker B honey store, In Bloom restaurant, a vegan cake company, pottery company, and much more, I went with my friend to the second level seating area where people munched on sandwiches and other treats. Overlooking the entire floor, we watched people and vendors and crowds moving around, tasting, drinking, laughing, and having a good time. The place buzzed with energy! I decided to sketch the Evla pottery area as there was a woman in a bright green dress with bright green glasses frames. The pottery was cool too. But what caught my attention most was the Forest to Fork Mushroom vendor. A two-story rectangular glass case housed shelf upon shelf of substrates of some type with mushrooms growing off of them. A large hose system blew steamy air into this huge glass area, and I was mesmerized as an employee, wearing a white face mask, used scissors to snip off mushrooms at eye level and above and put them into a cardboard box on the floor. These were then sold with the other merchandise on the other side of the case. It was interesting to watch, as I have never seen a mushroom vendor of any type, much less one in a giant glass case. I used watercolor pencils to sketch Forest to Fork and also a statue of a king holding a beer cup across the way. This was a great place to sketch and I hope to go back soon!